Create dramatic images by removing colors or changing them entirely. Gray out everyone in an image, except for you. Make the sky green/yellow/rainbow or whatever. 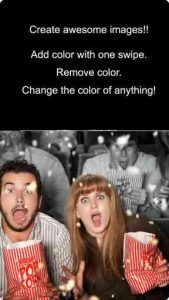 Change the color of anything! We recently had family photos done by a professional photographer. My wife had already picked out matching clothes that would go with mine and my sons outfit. I had a red plaid shirt, he wore a red shirt with navy stripes, and my wife wore a navy shirt to tie it all in. Well, the photos turned out great but my wife was a little bummed that she had failed to add any red in her outfit as the blue color in the plaid shirt I had on showed up more than we expected due to the background. Using “color effects” I altered the color of her shirt from blue to red in about 10 minutes! Once I had the color right, I went back and added the original color to everything else. My only suggestion would be to maybe have an option to grey out a selected area only to so that only that portion of the photo gets changed. This would prevent having to add the original color back to the full photo once the color change is successful. It worked perfect the way it is for this picture specifically but I think that an option like that would benefit in other situations. Regardless, thanks to this app, we now have our perfect Christmas card! I would highly recommend and It does exactly what it describes. Watch the video tutorial and you’ll enjoy it quicker with out having to learn it the layout. The video is only about 5 minutes or so and the narrators voice is very monotone, but it did help! Changing the color was pretty easy. Two items keep this from being 5 Star. 1. Doesn’t allow the user to start from the original photo. Changes it to black/white then the user must add back in the color. So if you just want to change a very small portion (maybe a shirt color in Family photo) you have to start with the entire photo. 2. Least desired attribute is the exported photo, once finished, looks blurry. Has the characteristics of a photo that has been highly compressed for export. If you are just looking to change something for Facebook … probably not an issue. If you want to print the final photo, this app probably not the right one.